Pharmacy soda fountains were inventing Float Recipes and serving "floats" as early as the 1890s. The first floats that became popular consisted of citrus fruit drinks called ades, upon the top of which was "floated" a layer of heavy cream, whipped cream, or even grape juice. Some old fashioned floats contained flavorful fountain syrups instead of citrus fruit juices, and soda water was often added for carbonation. Later, around 1900, sherbet and ice cream floats began to appear as brand-name soda pops became common. You can make a traditional ice cream float by first pressing a generous scoopful of frozen vanilla ice cream firmly into the bottom of a large frosted drinking glass. Next, slowly, and carefully, fill the glass to the brim with your favorite flavor of soda pop by pouring the ice-cold pop down the sides of the glass to avoid having it foam over the brim. Finally, carefully insert a couple of drinking straws into the glass along with a long-handled spoon to eat the melting ice cream. The ice cream eventually melts and floats to the top. The old time pharmacists often made ice cream floats using soda water and fountain syrup instead of soda pop. To make one, first drizzle two to four tablespoonfuls of your favorite fountain syrup over a scoopful of ice cream in the bottom of the glass and then carefully fill the glass to the brim with chilled soda water. Serve with two straws and a long-handled spoon. Try combining your favorite flavors of homemade soda pop and ice cream together to suit your taste. Colorful names were often given to the different ingredient combinations. For example, a root beer float with vanilla ice cream is traditionally called a Black Cow. Have fun naming your own frosty beverage creations. 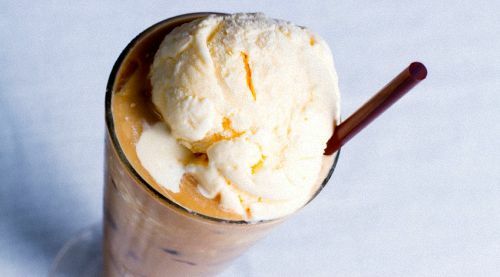 Below you'll find several old fashioned float recipes that call for heavy cream, grape juice, or ice cream to be floated on top of the beverage. Enjoy. 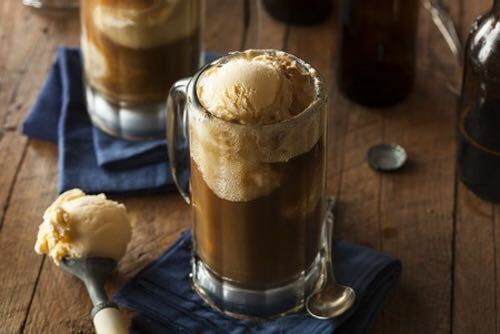 Fill a 12-ounce glass within an inch of the top with root beer, then float on top with spoon about 2 ounces plain, sweet, rich cream. The Root Beer Cream Float serves well as a novelty and should be priced at 10 cents. Fill a 12-ounce glass to within an inch of the top with plain lemonade, then carefully float on the top a sufficient quantity of grape juice to fill the glass, being careful not to disturb the lemonade. A good long drink, and a thirst quencher. Price—10 ounces, 10 cents. 1/2 ounce pineapple syrup, 1/2 ounce lemon syrup, 1/2 ounce orange syrup, 1 egg, 2 ounces plain cream, 1/4 glass shaved ice. Shake, strain, toss, and serve. Drop in a ball of frozen pineapple ice or ice cream (vanilla will do) to float on the surface and the Alaska Snowball is a winner. Price—15 cents; all milk, 20 cents. Place in a 12-ounce glass partly filled with cracked, not shaved, ice, 1/2 ounce of lemon syrup, 1/2 ounce of pineapple syrup, 1/2 ounce of orange syrup, and a little more than 1/2 ounce of grape juice. Fill the glass with carbonated water and stir until all is thoroughly mixed. 1 ounce strawberry syrup, 1/2 ounce orange syrup, 1/2 ounce vanilla syrup, 1/2 ounce grape juice, 1/4 glassful shaved ice. Mix the first three ingredients in a 12-ounce glass, three-quarters fill glass with carbonated water, add the ice, top with grape juice, and float the whipped cream over all. Charge 15 cents.